, corresponding to amino acids 126-140 of Human GAPDH. Our Abpromise guarantee covers the use of ab22555 in the following tested applications. WB 1/1000 - 1/5000. Detects a band of approximately 36 kDa. ab22555 stained MCF-7 cells. The cells were 4% formaldehyde fixed (10 min) and then incubated in 1%BSA / 10% normal goat serum / 0.3M glycine in 0.1% PBS-Tween for 1h to permeabilise the cells and block non-specific protein-protein interactions. 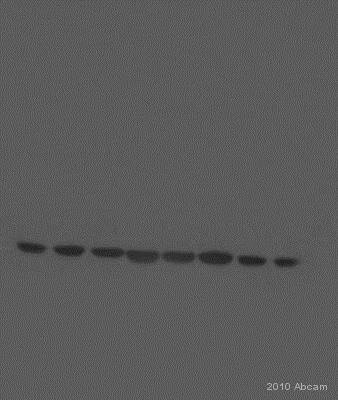 The cells were then incubated with the antibody ab22555 at 5µg/ml overnight at +4°C. 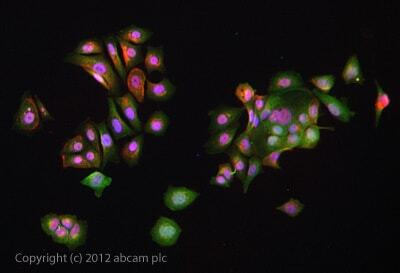 The secondary antibody (green) was anti-Rabbit DyLight® 488 (ab96899) IgG (H+L) used at a 1/1000 dilution for 1h. Alexa Fluor® 594 WGA was used to label plasma membranes (red) at a 1/200 dilution for 1h. DAPI was used to stain the cell nuclei (blue) at a concentration of 1.43µM. Publishing research using ab22555? Please let us know so that we can cite the reference in this datasheet. Customer kindly called to find replacement product for ab36840 in use on planaria. Thank you very much for your interest in anti-GAPDH antibodies. I have reviewed the products in our catalog in effort to try an find for you a product which was most similar to ab36840. I believe that the following two products offer the best alternative. AB75834 (https://www.abcam.com/gapdh-antibody-epr1977y-ab75834.html). This rabbit monoclonal was raised against a very similar region to ab36840. Therefore it may be likely that the same epitope site will be recogized by this product. AB22555 (https://www.abcam.com/gapdh-antibody-ab22555.html). This rabbit polyclonal was raised against an area just before that which ab36840 was. While this product will not be recognizing the same epitopes it's polyclonal nature will mean that it will recognize more sites than a monoclonal antibody. To our knowledge, these have not been tested in planaria. Therefore, I can offer a discount off a future purchase if you buy an GAPDH antibody now, test it in planaria and submit feedback to us in the form of an Abreview. It doesn’t matter whether the Abreview is positive or negative, we would just really like to receive your feedback. The discount would be to the value of: 1 free PRIMARY ANTIBODY. 1. Reply to this e-mail to let me know that you would like to proceed and test one of these in planaria. I will then send a discount code. This code must be issued before purchasing so please wait for my reply before ordering. 2. Purchase either by phone, fax, or online (www.abcam.com). 3. Test it in planaria. We are always pleased to obtain feedback about our products and any information is greatly appreciated! Even if the product turns out to be unsuitable for planaria, you will still receive the discount on your next purchase after your Abreview has been submitted.